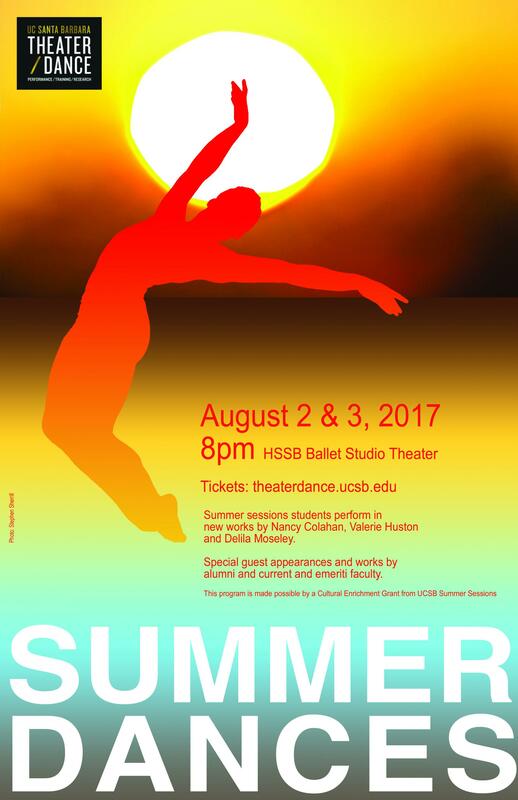 Summer Sessions 2017 will present Summer Dances, Wed. & Thurs., Aug. 2 & 3, 8pm, in the HSSB Ballet Studio. The program is full of variety, featuring choreography specifically created for the dancers enrolled in ballet, modern and jazz by Dance faculty Nancy Colahan, Valerie Huston and Delila Moseley. UCSB Dance graduates Chelsea Retzloff (2007) and Lauren Serrano (2011) will be performing new works as will Brandon Whited (Dance Faculty). Tonia Shimin (Professor Emerita) will offer a sneak preview into her new film currently in production, and Christina Sanchez of Santa Barbara Dance Theater will perform the powerful solo Cante Flamenco, created in 1944 by Jane Dudley. Lighting for these new works will be designed by UCSB Theater graduate Andrew Schmedake.